The Classic Monochrome Suite appeals to the inner minimalist, with a simple interior. 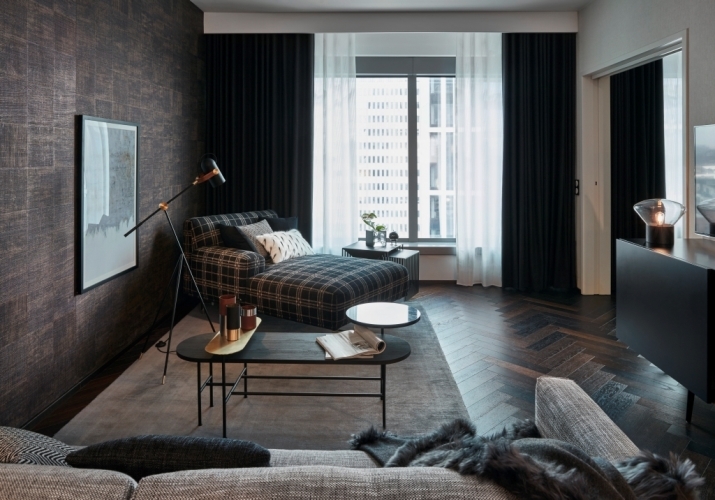 Using a traditional black and white colour palette, the décor is designed to remain timeless. However, to keep it interesting, the designers have incorporated a range of textures in the room. Dark wood, velvet, leather and fur adorn the suite. The stylish room includes a spacious bathroom with a free-standing bathtub for guests to sink into after a long hard day. The suite also includes a separate shower from Geberit/ Keramag and contemporary fittings from Kludi to wake you up in the morning. When entering the Modern Serenity Suite, guests are met with a contrasting vibe. Built with wellness in mind, the room has been designed to create a tranquil setting. Light wood, pastel, furnishing and soft grey tones lend themselves create an airy vibe. Villeroy & Boch bathroom are responsible for the Modern Serenity Suite which offers a walk-in rain shower and large bathtub. 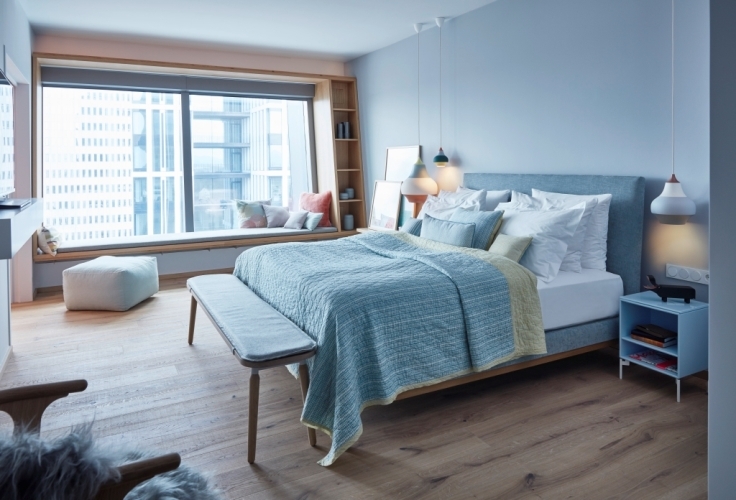 If you don’t fancy staying in a suite (or can’t stretch the purse strings that far) the hotel also offers regular rooms with four different theme options to choose from. Each room has been designed by Italian designer, Matteo Thun, with themes styled around the terms: ‘at home’, ‘chic’, ‘fashion’ or ‘fresh’. Hotel activities involve relaxing in the Heaven Spa and indoor pool, both of which are located on the 18th floor offering amazing skyline views. Top top it all off, there is a real-life beehive on the roof which provides the hotel with a sweet supply of homemade honey. 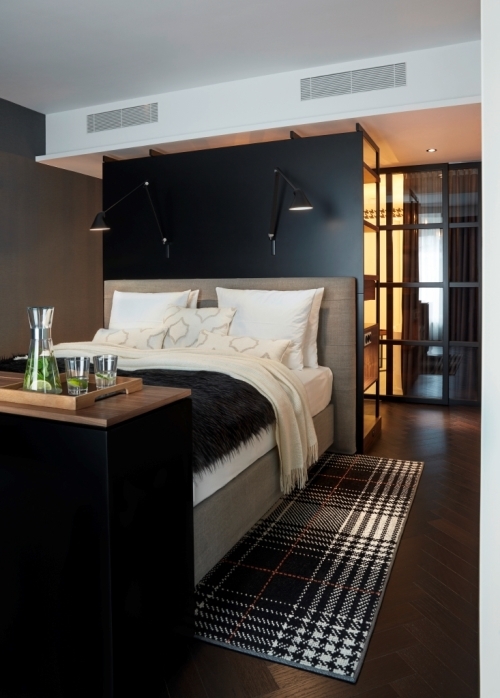 Room rates at Radisson Blu Hotel, Frankfurt start from €109 (approx. £96) for a standard room including Radisson Blu´s Super Breakfast. Wohnidee suites starts from €459 (approx. £412) including Super Breakfast Buffet. We can’t wait to book our stay.